I've explained this one a number of times, and I even posted a challenge I created for CP Europe, but the attack itself I only explained in Spanish. So we know RSA uses big big numbers and performs a modular exponentiation over them. However, modular exponentiation algorithms tend to be expensive in computing time so people try to find ways to make them faster. In any case, most implementations have an execution time that is linear with the key size, which means that when you double the key size the exponentiation time doubles as well. This is where RSA-CRT comes to the rescue. This way of implementing RSA is based on splitting the exponentiation in two halves. For this, they make use of the Chinese Remainder Theorem, which basically says that you can compute a result modulo by splitting it into two computations modulo p and q respectively. And, oh surprise, this number is a multiple of one of the primes. Thus, if we compute the Greatest Common Divisor of c-c' and n, we obtain the common factor p. From there we can compute the other prime, q, by just dividing n/p. And with this we know all the information we need to obtain the private key d. This attack is referred to as the Bellcore attack, due to the fact that it was published by Bellcore labs in 1996, and is a deadly attack against RSA implementations using CRT and not protecting themselves sufficiently. DES round: the F function is applied to the right half, and then the result is XORed with the left half. The right and left half are exchanged afterwards, and this process is repeated a number of times. Now, imagine you are able to know the input/output pair of the F function. 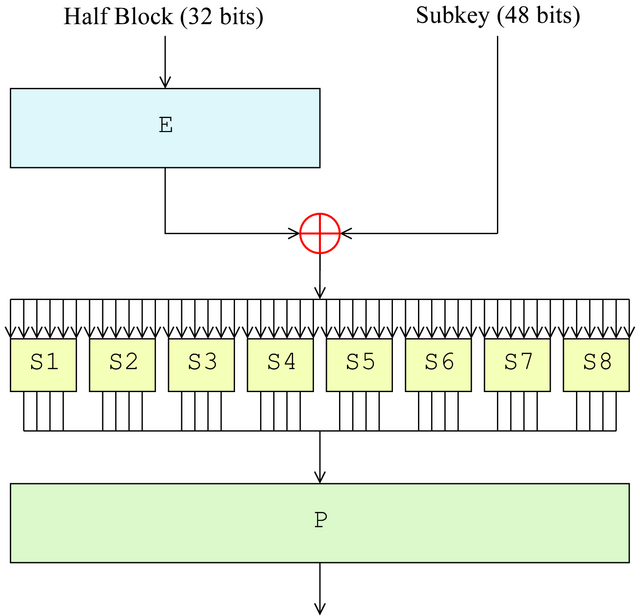 Since the key is used only 6 bits at a time, you can easily try out each one of the 8 sub keys (64 possibilities for each of them) and find whether the related output bits match or not. This only requires 8 6-bit bruteforce attacks (9 bits in total) to obtain the whole round key. Obviously, this is not possible... that's precisely why you XOR it with the other half of the state and add more rounds to the algorithm: you don't want people to be able to break it so easily! However, let's assume we can inject a fault in the input of this function for the last round (or a fault during the execution of the previous round, which leads to the input of the function for the last round). Now, from the output of the algorithm, we can obtain two pairs of inputs to the F function: correct and faulty inputs. Additionally, the other two halves give us the result after the XOR for the two executions: good and bad execution. However, the value that has been XORed with them is computed during round 14 (i.e. two rounds before the end) and has not been affected by our fault injection attack. Now, remember that I said that only 6 bits of the key are used each time. And they pass through the S-boxes, and then they go into the P permutation. Now, since we have these input/output relations, we can use the correct and incorrect inputs, XOR them with a 6 bit key guess and perform the S-box lookup. Then we XOR these two results, and we have the output difference as well. It turns out (and here is the magic) that thanks to the S-box structures only a few values for the sub key will match. Thus, this allows us to reduce the entropy of the key. If we repeat this a few times, then we can reduce the list of possible keys to one. Or alternatively, we can give a point to each key that matches at every attempt. Then we get a number of these faults, perform this process for each of them, and then check the highest score: this is our key. If you repeat this process with round 15 instead of 16, then you get enough information for a full DES key. If you have Triple DES, then you need to move over to the inner DES and repeat these two steps again. Alternatively, if input and output to the DES/TDES are known you can stop when you still miss the last round key, and bruteforce the last portion of it (just 8 bits). As I said before, not only DES and RSA are susceptible to DFA attacks. In the literature, one can find several DFA attacks for AES, Camellia, elliptic curve implementations, etc. For an application running under the control of an attacker (being it a hardware implementation such a smart card or other types of implementations) it is important to apply adequate countermeasures in order to protect the keys. State-of-the-art countermeasures at the software level typically include double-checking results, adding time variation to the algorithm so that the attacker cannot predict the point of injection and in general adding redundancy in order to detect the attacks and react accordingly. Hopefully this post helps raise awareness on this kind of attacks 🙂 Any feedback is more than welcome! nice, thanks for the explanation.